Chopped. So terribly unvegan, but something I sometimes find myself watching. I kinda like seeing what some of these chefs can do with some pretty strange combinations. Recently, I saw an episode where the chefs had raspberry-lavender risotto and napa cabbage as two of their ingredients. They had a couple of other things, but I don’t know, I think they were meat and cheese, so naturally I don’t remember. I was really inspired by these weird ingredients. I decided to grab some organic freeze dried raspberries, some lavender and some Arborio rice and create my own blend. I also went and picked up some napa cabbage and Field Roast Italian Sausages for good measure. I heard one of the judges say that fennel seeds would work well for tying some of the flavor together. Field Roast Italian Sausages are made with fennel and other goodies that ultimately worked well for this risotto. The result was this really unique tasting dish. I can’t say I’ve had anything like it before. I couldn’t really taste the raspberry, but the other flavors came through. The raspberries actually disintegrate while the risotto is cooking, but hopefully they imparted some flavor, maybe I just didn’t taste it. If you’d like to recreate this recipe, just make your own blend with dried lavender and freeze fried raspberries—I don’t think fresh would incorporate the same way, but you never know. 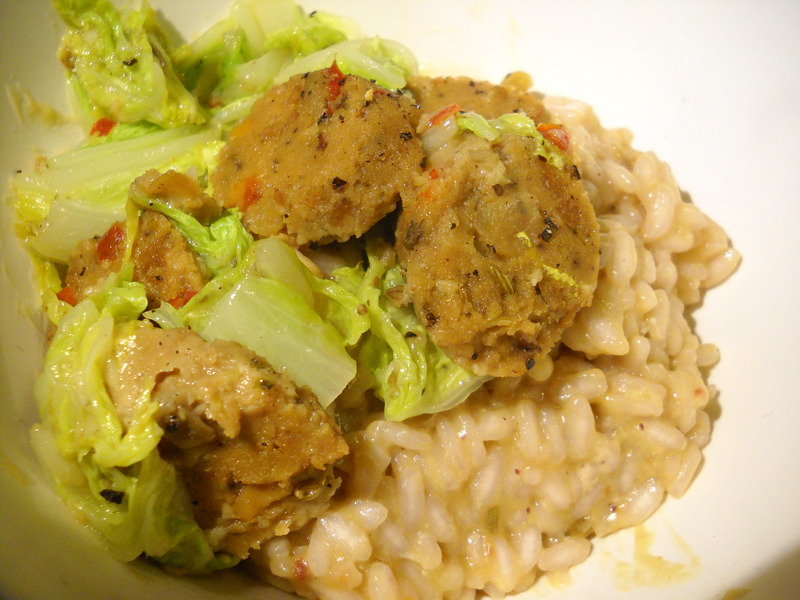 I seasoned and cooked the cabbage separately, with the Field Roast and added that to the risotto after I cooked it. Which, you know, is just oil, an aromatic (onion, shallot, garlic), rice, white wine, lots of broth, vegan cheese optional. Just keep stirring, just keep stirring. ← Fried “Egg”wich w/ “Bacon” & “Bleu Cheese” Crumbles.